See how small the XA is! I was in Texas over the past week & 1/2. I visited Houston, San Antonio & Austin both for vacation & for photoshoots. During my downtime and while not otherwise occupied I did street photography. I used both a Sony A6000 (I know, don't hate on my for referring to a digital camera on my film blog) and this beauty, my Olympus XA. 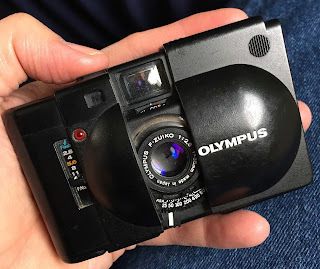 This is a slick little 35mm rangefinder, that is super easy to use. Just set the desired aperture (on the sliding dial to the right of the lens) and set the focal distance. You are good to go. There is a very small split focusing area in the center of the viewfinder that helps in focusing (although I mainly eyeballed the range) and a speed gauge in the viewfinder. It's really that simple. Once you set your desired aperture you press the shutter release. The gauge tells you what speed was selected. Obviously, if you want faster or slower shutter speeds you just change your aperture. It ranges from "flash", through f/2.8 through f/22. An excellent range. The camera is tiny and is super silent. 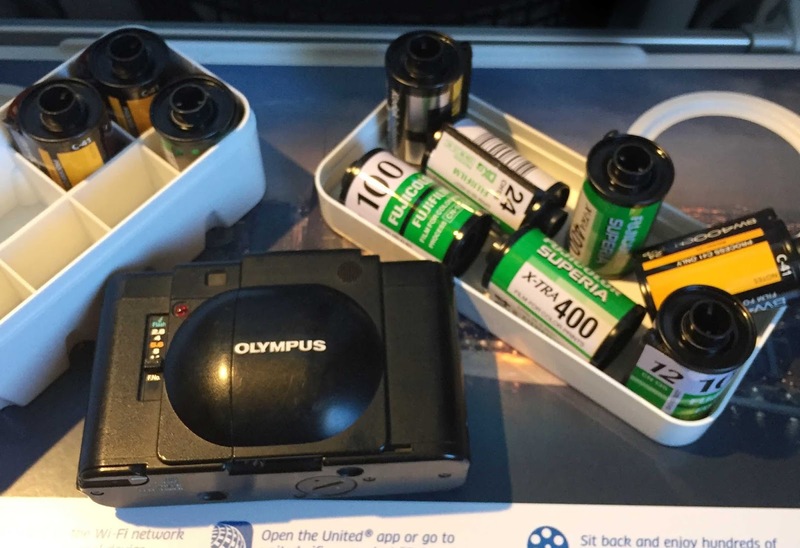 Perfect for a film street photographer. The only gripe I have with the camera is there is no shutter lock. 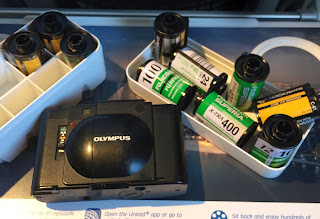 Therefore, if you advance the film and put the camera in your bag (even with the lens cover closed) the slightest touch not he very touchy shutter release button on top of the camera releases the shutter. I'm sure I have at least 12 misfires. Anyway, other than that, the camera is uber. I went through about 10 rolls along with my digital shots. I'll post some images after I get the film back.